All text in Word is formatted using styles, whether you chose the style or not. 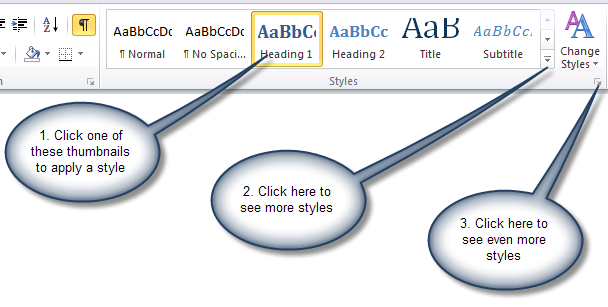 Use Word styles to format your text quickly and consistently. What's a style and why would I want one? Few of us would create a document in which every paragraph looked the same. We use structural elements (such as a title, headings, sub-headings, or captions to pictures) to help our readers make sense of our documents. Typically, we want to format each element consistently. We want all the body text in a smaller lighter font, but the title in a larger heavier font. We need a lot of vertical space before all the major headings, but none before the captions under pictures. In Microsoft Word, a style is a collection of formatting instructions. You use Word styles to identify and format the structural elements in your document. So you would use the "Title" style for your title, "Body Text" style for body text, "Caption" style for the picture captions and "Heading 1" for the major headings. Tips for understanding styles in Word, which I originally wrote for Microsoft's website and which is now reproduced here. Getting started with styles [NOTE: outdated link removed by Lene Fredborg 17-Feb-2017] by Dian Chapman at mousetrax.com. The Seven Laws of Styles by Bob Blacksberg, from Woody Leonhardt's Woody's Office Watch newsletter which is available at Seven Laws of Styles. Other articles about styles on this site.